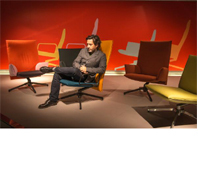 In occasion of the 5th edition of PARIS DESIGN WEEK – in synergy with MAISON & OBJET PARIS – Knoll present the Pilot Chair collection from September 5 to 12 at the showroom in Paris. For eight days, the French and international people are invited to discover the innovations of the season in one of the best design addresses in Paris. During the installation, the renowned design company will present its new chair by London-based designers Edward Barber & Jay Osgerby. The collaboration between Knoll and Barber & Osgerby Studio is a modern, innovative piece perfect to furnish any type of space, from residential to workplace. This is a continuation of the collaboration between Barber & Osgerby and Knoll, which began in 2013. The slim backed chair has a striking profile that will perfectly suit the domestic setting whilst also adapting to an executive armchair. The Pilot Chair has been developed around a simple ‘T’ shaped aluminium frame. Seamlessly mounted to the frame are the moulded foam seat, back, aluminium base and armrests. At first glance the cantilevered seat seems to be almost floating in the air. This particular feature brings greater flexibility to the seat and lightness to the structure, while creating a unique silhouette for an essential, timeless design. The back can be high or low, for contract or residential use with coverings ranging from fabric to leather. The padding of the seat and back is available in a lighter “slim” version and a “soft” version for greater comfort. By varying the type of covering or by changing the finish of the armrests which are available in metal or upholstery, the chair can be transformed in both its image and functional role. The Pilot Chair for Knoll is the sum of elegant design, comfort, exclusive materials and fine craftsmanship and a perfect example of the approach the two English designers apply in all their projects.